With the opening of a UARA new season came new cars, new rookies, new veterans, new teams, new rules, new sponsors and… new tires. The new Goodyear tires were the talk of the track on Friday night. Some drivers didn’t mind them. Some drivers hated them. But in the end, the verdict is still out on the new rubber and how they’ll affect racing. There weren’t a lot of happy campers after Saturday night’s race. The UARA is the first series to use Goodyear’s new D2602 Short Track Special. Built in Goodyear’s Technical Center in Akron, Ohio, the D2602 is a bias-ply tire and measures 27 inches tall by 10 inches wide. It fits on a 15-inch wheel and uses Goodyear’s A400 tread compound. The fact of that the race featured very little passing among the cars at the front of the field. It was hard to pinpoint if that was because of the number of cautions, the cold temperatures, the close field or the tires. “Goodyear brought that new tire and it was pretty hard,” said Jamie Yelton, who was a test driver for Goodyear when testing the new tire. “I don’t think the tire did as good as they had in mind. I think the new tire is ok. Goodyear will get back and they’ll fix it. I still don’t think it is the right tire for these cars. “The tire is really, really hard and if you look at it, it looks narrower than a 10 inch tire. They had to give us 12 laps to get our tires hot enough to run. 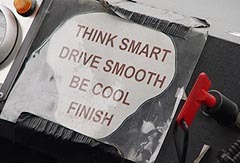 If you have to do that on a late model stock car, you got to change something. Fifth-place finisher and defending series champion Jason York was not a fan of the new tire. “I think this new tire is junk. I think the tire we had last year was a lot better tire. Goodyear is saying that we’ll have better tires in about three races. Hopefully, we’ll get some. 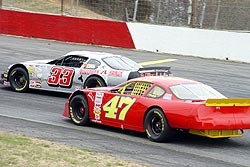 There were a lot of cars that showed up to Hickory Motor Speedway to try and get into the field for Saturday night’s 150-lap race. In fact, there were so many cars that UARA officials elected to run two separate lace chance races, transferring two cars out of each race to the feature. A total of 46 cars were on hand Saturday, with 42 taking qualifying times in hopes of getting into the 28-car starting field. That meant several drivers were going home. No name was bigger that went home than last year’s 10th-place point finisher Nick Hutchins. Hutchins qualified just two spots out of the top-22 that were locked in and was forced to run one of the last chance races after two other drivers who finished ahead of Hutchins in the 2004 points had to rely on provisionals. Hutchins started on the pole for the second last chance race, but was involved in a first-lap accident that took him and a couple other cars out of contention. Rhinehardt, David Hopkins, Marc Davis, Michael Giesson, Neil Jordan, Kyle Gregson, Greg Weeks, Dexter Canipe Jr and Mark Burdette. Most people would consider a third-place finish in the points and a couple of wins a decent year. Not Lee Tissot. The 2004 season is one Tissot, the 2003 UARA champion, would like to forget. 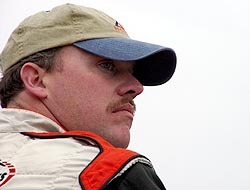 He split with car owner Mitch West during the season and found a new home with the #33 team of Brad Allen. Now, he’s ready for a whole season with the #33 and his third-place finish at Hickory was a good start. “We are going to run this whole series this year and try to win the championship,” said Tissot. “I had a horrible year last year. Things just weren’t working. But things have a way of working out I guess. We are hoping this year will work out a lot better. Everyone is calm and cool and we are just ready to go racing. to head and I left. I got in a Leicht car and went right to the front. We got another Leicht car here and we’ve been good in it. Last year, the son of a famous NASCAR driver stole the rookie limelight in the UARA Series and did so in style. 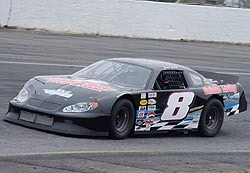 Steve Wallace (Rusty’s son) not only won the series Rookie of the Year, but a couple of races along the way as well. He took a big step in doing so by finishing eighth on Saturday night. 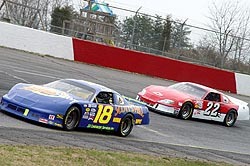 There were a lot of good cars at Hickory, and veteran Jamie Yelton was impressed. And Yelton was right. In fact, after McCall’s dominating qualifying run, the rest of the top-22 qualifiers (all that were locked it) were separated by just over two-tenths of a second. To put that into perspective, you can’t snap your fingers in two-tenths of a second. 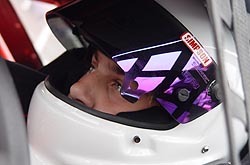 Yelton had a solid run, finishing fourth, after winning a race at Hickory last season. practice. I didn’t. I’m not sure if it paid off or not. 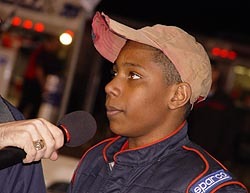 Last week, when NASCAR powerhouse Roush Racing put out a press release announcing their newest driver development drivers, 14-year-old African-American driver Marc Davis was on that list. This past Saturday, he made his UARA debut. Unfortunately, the youngster didn’t make the feature. He was forced to run in one of the last chance races with his #34, but got caught up in an accident not of his making when Nick Hutchins spun from the pole. Davis was able to continue but the extensive damage to the front of his car prevented him from being a factor in the race. The #34 that David is running has special meaning.